Plums – Dig Delve – An online magazine about gardens, landscape, growing & making. Planting the fruit orchard was one of our first major projects the winter we arrived here. I knew where I wanted to see it almost immediately, on the south-facing slopes beyond the barns to the west. Nestled into the hill, it was to continue the spine of productivity that runs along this contour. House, vegetable garden, barns, compost heaps and then orchard. It had a rhythm to it that felt comfortable. 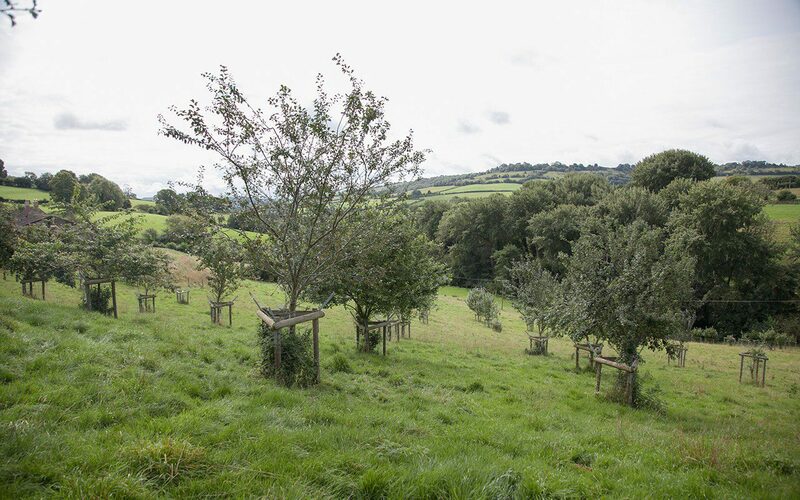 Later, and after it was planted, neighbours told us that there had once been fruit trees growing on the same slopes, so it was right to have made the move so quickly. 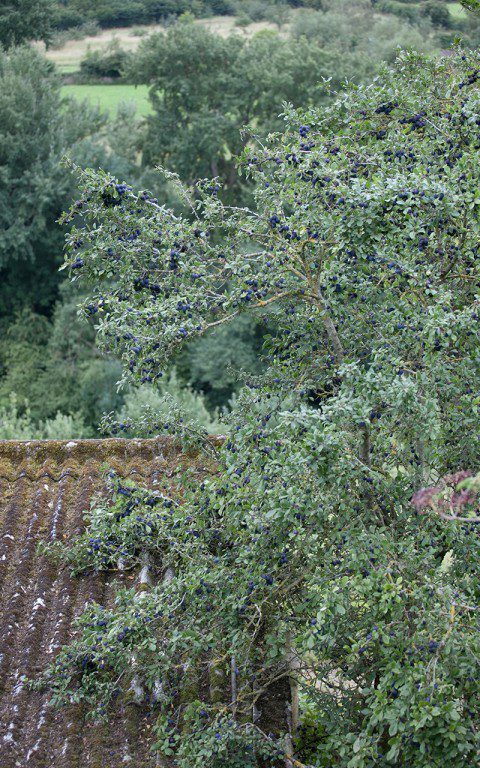 I’d been wanting to plant an orchard for myself for years and made my lists with relish, choosing West Country apples, both cookers and eaters, and a number of pears and plums. I paced out the planting stations in an offset grid with 8 metres between the trees. Doing it by eye meant that it went with the slope and the grid took on a more informal feeling that was less rigid. Thirteen apples were set on their own on the lower slope, whilst five pears and then the plums sat above them. In making the decision as to how the orchard should step across the slope, I noted how the frost settled and where the cold air drained as it pooled lower in the hollow. The pears, which like a warm, sheltered position, were planted up close to the barns in the lea provided by the hedge and the buildings. The later-flowering apples were placed lower down the slope in the hope that the frosts, which tend to hang low, were mostly over by the time they were in blossom. The early-to-flower plum orchard was put on the highest ground that linked to the blossom wood in the next field above, as they also prefer a warm, free-draining position. Here they have so far escaped the frosts. To date, for there is still always time to learn, I am happy to have gone with my intuition. The plum orchard is a loose term for the collection of a dozen or so trees that now inhabit this top corner of the field. I say loose because they all have different characteristics that are driven by the original species from which they have been selected, or from the cross between the edible species. 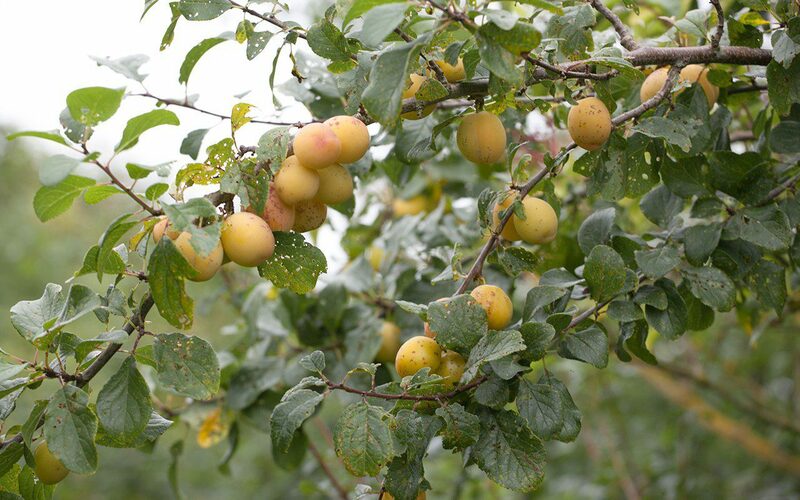 So, to explain, the plum orchard includes true plums, mirabelle plums, damson plums and greengages. 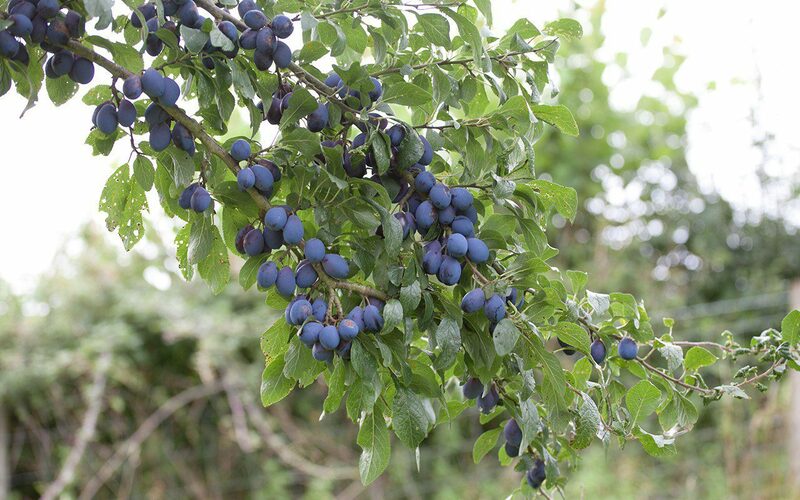 We also have two bullace, an old term for a wild plum. Three yellow ones, given to us by a local farmer who has them growing in the hedgerows above our land, are planted in the hedge between the plum orchard and the blossom wood. 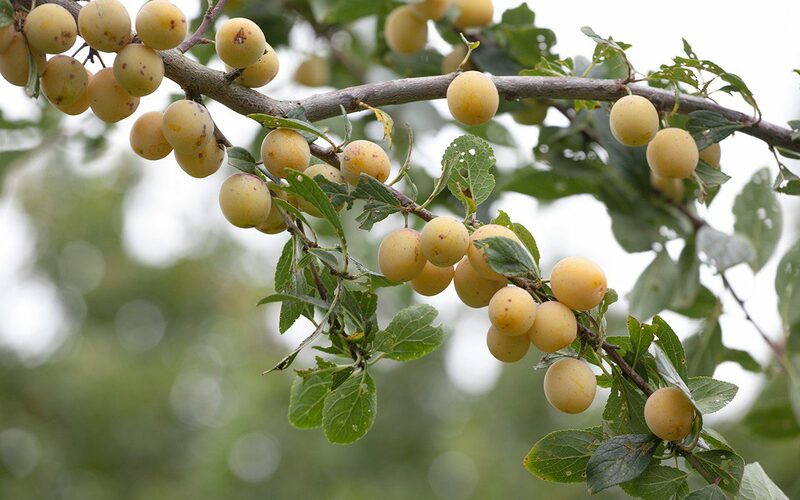 They may be ‘Shepherd’s Bullace’ or ‘Yellow Apricot Bullace’, two old named varieties that were once very commonly grown. These make a link to an ancient, gnarled tree by the barns, which is dark violet and eats like a damson. The cherry plums (Prunus cerasifera) sit in the blossom wood itself. First to flower, and indeed to fruit, are the cherry plums, which are good both for February blossom and jam making. Their flavour reminds me of the perfumed Japanese ume plums and we have in the past made a delicious plum brandy from them. In the orchard it is the mirabelle plums (first recommended to me by Nigel Slater, who grows them at the end of his garden) that are the first to flower and fruit. 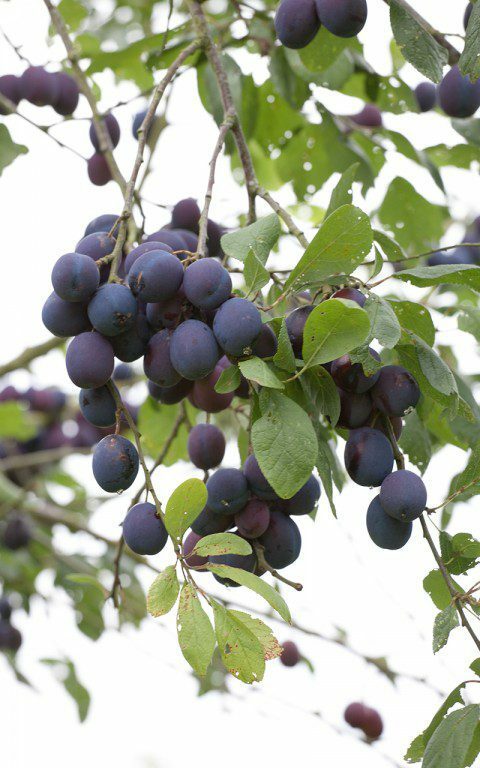 Originally from Eastern Europe, but grown to perfection in France, this is a small plum, usually with a tart flavour. 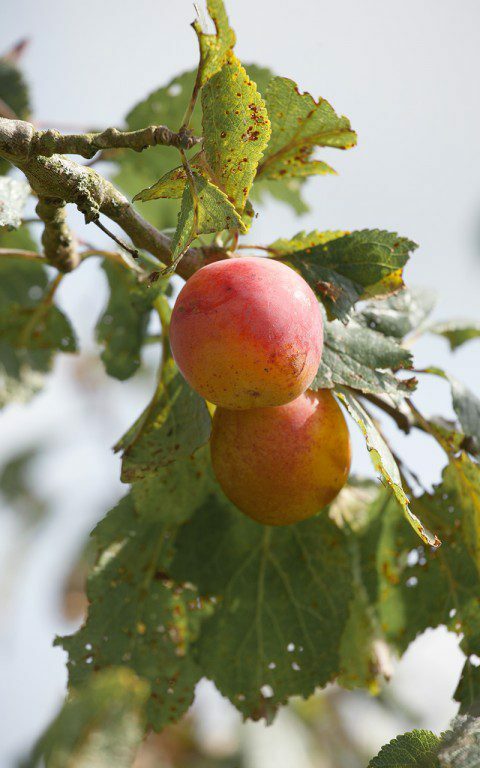 Generally preferred for cooking, ‘Mirabelle de Nancy’ has marble sized, apricot-coloured fruit which are fragrant and sweet enough to eat off the tree if picked just before they drop. ‘Gypsy’, with larger red fruit, is a cooker and the earliest of them all, ripe almost a month ago. 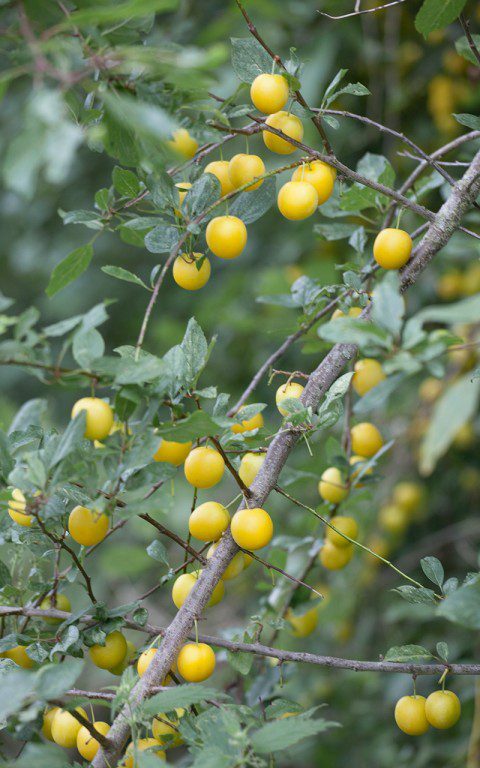 If I were to lose one, it would be ‘Golden Sphere’, whose flavour is bland in comparison, but it is a pretty plum, well-named for its colour. If I were only able to have one plum tree, it would be a greengage. As a rule, the yellow plums are said to have better flavour than the reds, but greengages are the most aromatic and, in our opinion, the most delicious. Of course, there is a small price to pay for such a delicacy, as greengages have a reputation for being shy to fruit. I have five in the orchard. ‘Early Transparent’ is the most reliable and has fruited plentifully. ‘Denniston’s Superb’ fruited well this year too and has the very best flavour. Despite the skins being less than perfect, the greengage perfume and the depth of flavour of this greengage is superlative – as refined and floral as a good ‘Doyenne de Comice’ pear or, if you were living in heat, a freshly picked white peach. I have three more greengages that are yet to prove themselves; ‘Reine Claude de Bavay’, which is famously shy to fruit, ‘Bryanston Gage’ and ‘Cambridge Gage’, which the sheep have managed to reach, pulled at and damaged, so I am waiting patiently for results next year. We have two true plums in the orchard. ‘Victoria (Willis Clone)’, a selection that is reputedly free of silverleaf, an airborne bacteria to which ‘Victoria’ is prone and which can infect broken branches in the summer. Plums, particularly the heavy fruited ‘Victoria’, are famous for snapping under the weight of their fruit, so I have taken to gently shaking the tree a little earlier in summer to lighten the load that the June Drop hasn’t done for. 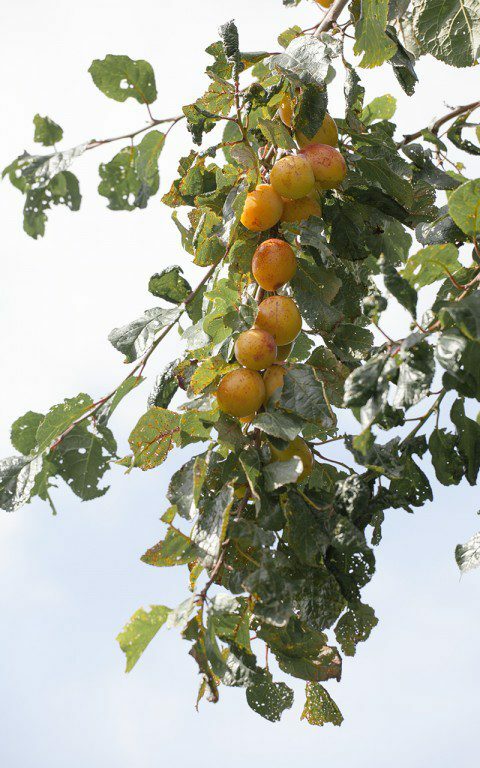 Though the ‘Victoria’ is a good looking plum – it is next to ripen after the greengages – it is nice but rather ordinary. It is, however, indispensable for freezing for winter crumbles. ‘Warwickshire Drooper’, a vigorous and amber-fruited plum, is better I think. Adaptable for being both an eater and a cooker, and not a plum you can buy off the shelf like ‘Victoria’. It is also a very heavy cropper and makes delicious jam. The damsons are perhaps the most beautiful, hanging dark and mysterious, with a violet-grey bloom that, when you reach out and brush the surface, reveals the depth of colour beneath. These are the last to fruit and this year I fear we will miss them in the fortnight we go away on holiday in early September. ‘Shropshire Prune’ (main image) has proven itself to be one of the most reliable fruiters with small, perfumed fruit that are firm and make the strongest flavoured jam. 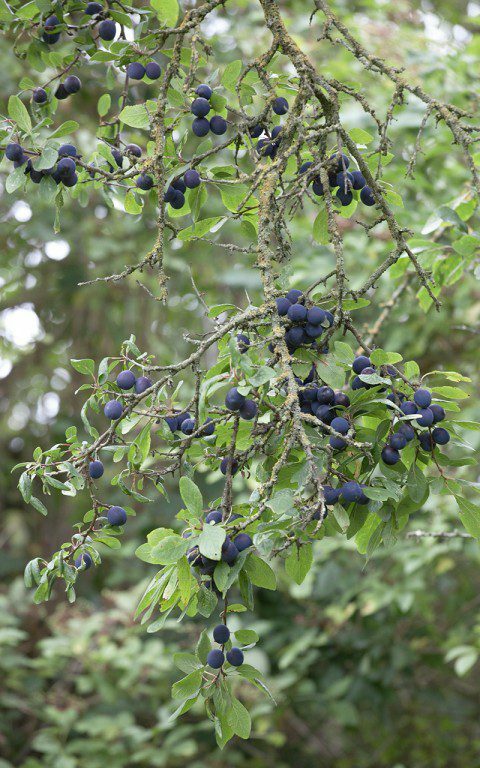 A little earlier and larger of fruit, ‘Merryweather’ also has very good flavour and is one of the only damsons sweet enough to eat from the tree if left to fully ripen. 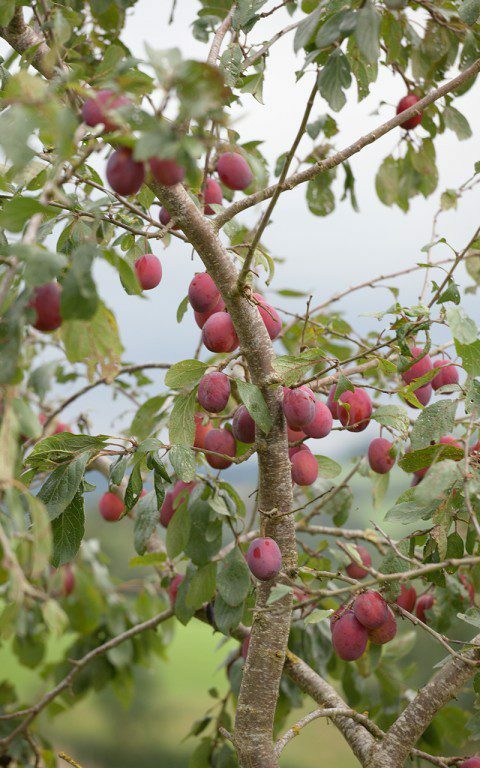 The plums are something you have to watch as they ripen, for they take some time to ready but, when they do, they all ripen over the space of a fortnight. 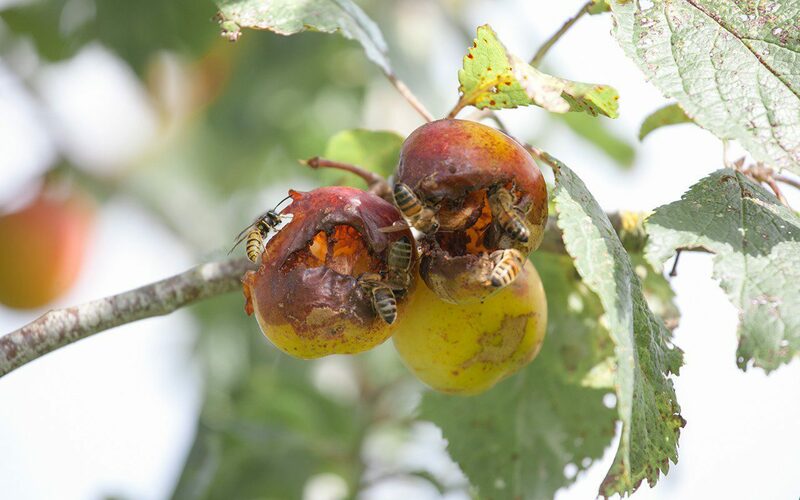 The range of varieties in the plum orchard helps here in staggering the harvest, but getting to them before the wasps do is always a challenge. This year, however, we are bombarded with fruit which means there is plenty to go round, and I have been heartened to see that the rotting fruit also provides a late summer larder for honeybees and butterflies. I have a long, three-legged ladder with an adjustable third leg ideal for picking on our slopes but, for expediency, it has been quicker to lay down tarps on the hummocky grass and gently shake the trees. The fruit cascades around you and you can pluck the best without reaching into the branches to be stung by the competition.